Compared with graphite, graphene has large van der Waals force. Therefore, its particles are likely to cohere and adhere with each other, and tend to return to graphite. Accordingly, it should be avoided to crush and classify under dry condition while keeping the condition of graphene. In InALA process of our company, graphene is prepared independently while preventing the pieces from adhering with each other. Successively, a piece of graphene is crushed in a solvent while preventing the particles from adhering with each other, and each piece of graphene is dispersed in a solvent. The product made by dispersing each piece of graphene in the solvent is the GRAPHENE FLOWER dispersion liquid. Graphene in a dispersion liquid is trapped on a filter (micro grid). The part surrounded with a red circle is graphene. Control of the dimension of graphene is possible! 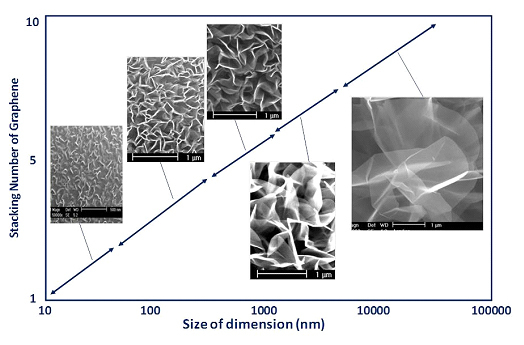 Since Graphene Flower is the directly synthesized graphene based on bottom-up system, it is possible to control the dimension and thickness of the graphene by controlling reaction conditions. When graphene is likened to cherry blossoms, the growth degree of flowers from just beginning to open to reaching full bloom can be realized by controlling the parameters such as reaction time and temperature. This is a carbon dispersion liquid made of several layers of graphene as a main component, which was synthesized using InALA process without substrate and without catalyst. It is possible to control the dimension and thickness of graphene. Graphene has high crystallinity and high chemical purity. Graphene is not graphite oxide, nor graphene oxide. It is possible to supply a highly concentrated dispersion liquid using a proper solvent according to the application. This is an example of the specifications of Graphene Flower. Specifications for Graphene Flower dispersion liquid: Please refer to the price in this page. Electroconductive auxiliary for various cell electrodes for lithium ion cell, fuel cell, etc.